It has been found that the average computer user utilizes less than 10% of the potential power or capabilities of their home or office PC. More often than not, even the most avid user simply did not know that their computer was capable of performing a certain task or that a new piece of hardware or software was available to do exactly what they want. This industry changes so quickly that it is almost impossible to keep up with technology changes. This section offers information and reviews on new products as well as older but lesser known products that can improve or enhance the way you use your computer. We have experience with most all of the products and technologies discussed below, so feel free to email us with any questions. We do not endorse and in no way guarantee their use or effectiveness. For as little as $50 and an available cable connection, you can install a TV Tuner card into your personal computer to view live television on your computer monitor. Watch the morning news or favorite show while reading your email or working on a project. Some models will allow you to record TV or Camcorder inputs to your hard drive to create a digital video recorder. USB external units are also available for those of you who don't want install PCI cards. 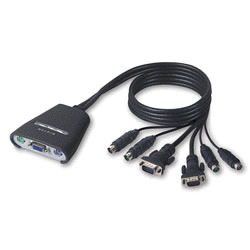 Available from ATI Technologies, Hauppauge, CompUSA and others. One of the most common problems that plague computer users are power outages, brownouts and surges. For as little as $40 you can add a UPS (Uninterruptible Power Supply) to your computer. All it takes is for the power to go out at just the wrong time and you could loose everything. These devices sense power line changes and switch to an internal battery in the event of a power failure. They also include surge suppression. This gives you enough time to save your work and shut down properly. More expensive units can allow you to work for hours without power as well as shut your system down automatically when the batteries start to run down. Some of these products are available from APC and CompUSA. If your computer and the data on it is important to you, one of these units is an essential purchase. Note: The rechargeable battery in these units usually needs to be replaced every 4 or 5 years. Setting up a Home Network can be as easy as plugging two computers into each other, but in today's home of multiple computers, Gaming systems, TV Recording Devices and Multimedia Entertainment Systems, some home networks have become a very complex system. Creating a wireless connection to a laptop is one of the most common needs and this can be accomplished for as little as $30 (on sale). This would allow you to take your laptop from room to room or even outside to work on the patio. One thing to keep in mind is that wireless networks are not perfect and don't expect to get the advertised range. The range depends on many factors. See our F.A.Q. Section for more information on Wireless Range. Wireless network products are available from Linksys, D-Link, Netgear, Belkin, CompUSA and others. Today's needs for alternate storage has never been greater. Small USB Thumb Drives can store up to 32 gig of files, music or even video. That's the equivalent of 45 CD's or 23,000 floppy disks. Now you can take that PowerPoint show with you or work on that big project at home. Great for short-term backups. When plugged into any USB port, they will come up as an additional hard drive on your system. No drivers needed for Windows 2000, XP, Vista or Windows 7. You need to download drivers to use them on Windows 98 and ME. These storage devices come in all types of shapes and sizes. Many are designed to attach to a key chain or come in the shape of a pen. Expect to pay as little as $10 for a 2GB unit and up to a hundred dollars for the large ones. Available from PNY, Sandisk, Sony, Lexar, CompUSA and many others. If you need even larger portable storage, you can get portable USB hard drives with storage up to 3TB. They don't exactly fit on a key chain, but will allow you to store a huge amount of data. Many of you have more than one computer and would like to control multiple computers with one monitor, keyboard and mouse. Keep your important data and projects safe by setting up one computer for work and one for Internet and email. Work on multiple project at once. A simple keyboard command switches you between each computer. A two computer KVM switch will run you about $49.00. Be careful, many units do not come with cables and will cost you an additional $60. Available from Belkin, CompUSA and others. Let's say you want to keep an eye on your business while you are away or check out your summer home to make sure things are safe. How about looking in on your elderly parents or checking in on what your babysitter is up to. All these things are possible with the array of new video products. In some cases, you don't even need a computer on the other end. For example, Veo has a network camera for about $199 that you can pan and tilt to view what is going on from any internet connection in the world. It plugs directly into a network connection and can be installed directly to a router and cable/DSL Modem without the need for a computer. You need a computer to initially set-up the router, but after that, the camera just sits there waiting for your command. There is also a wireless version available for about $299 as well as others from D-Link and Panasonic. For the security minded, Xanboo has a system of inexpensive cameras, motion detectors, door/window sensors and power outage detectors that will email you when someone has entered your protected area or the power goes out. When triggered it will record a still image or video, email your cell phone and you can log on from anywhere and see what is going on. There is a small monthly charge for this service. If you don't need all this technology, there are many simple $50-$100 web cams that can detect motion and record video to your computer when someone enters into the view of the camera. So if you want to know who has been touching your computer while you were away, then this is for you. Many of you may have tried Voice Recognition products years ago when they first came out, I know I did. It seemed like a great idea at the time, but the technology just wasn't there. Well, today's products have finally reached a level where I can say that they really work. If you spend a lot of time at the computer replying to emails or writing countless documents, then it might be time to give it a try. There are many factors that effect the overall accuracy of voice recognition, but if you can control some of them, I have found that it can be a real time saver (as well as relief for your carpel tunnel). With the proper equipment you can even dictate into a voice recorder or pocket PC and convert your notes to text later or drop them right into your contact manager. The one I have been using is Dragon Natural Speaking. They have several versions of the software depending on what it is you want to do. If you just want to dictate into emails or instant messaging, you can start with the $60 package. but if you want to the full package it will run you $199. They all come with a headset/microphone which if used will give you the best results. Having said this, don't expect to be able to dictate into your laptop while driving down the road, listening to the radio and eating donuts. You need a fairly consistent environment with little background noise, set the microphone at a repeatable distance and talk in a normal tone. With a little patients, you can be up an running in less than 30 minutes. Many heavy business users find it difficult to manipulate multiple documents and applications on one screen. You find yourself going back and forth between word documents, the internet and email. One little known but very useful system is to have two monitors connected to a dual display video card. With this setup, you can be researching a topic on the internet on one monitor while writing a paper on the other. Simply drag your applications, files and photos from one screen to the other. You could be watching a DVD on one screen while reading your email on the other. It is the next best thing to having two separate computers. The best, most reliable way to set up a dual display system is to replace your current video card with a Dual display video card which can be purchased for as little as $60. However, it is also possible to just install an additional video card in your computer but can be more problematic to setup. Most of us have an extra monitor hanging around or if not, the price of monitors has come down over the years. Once you go dual you will wonder how you ever lived with out it. Backing up your computer is more important than ever now that so many people use their computers for storing digital photos, music, home videos, music files, personal finance and home business data. It is not uncommon for a typical home computer to contain many gigabytes of important data as compared to just a few years ago when the only data on most home computers was a few megabytes of word files and maybe some quicken files. With so many computers coming with CD and DVD burners, it is fairly easy to make backups of your music, video and photos to a CD-R or DVD. Unfortunately, this can be rather time consuming if you have more than a few gigabytes of data to save. There are several options for backing up large quantities of data. These New USB Hard drives are simple to install and run. Just plug them into an available USB port and you instantly have an extra hard drive. You can set them up to backup your entire computer with the push of a button or simply drag and drop your important files. Units are now available in sizes up to 3 terabytes. They are available in sizes from 250TB to 3TB for between $40 and $300. Some models contain both USB and Firewire connectivity and some also have Ethernet ports. Installing a second hard drive in your computer is one of the least expensive and fastest way to backup your data. I recommend a second drive in every computer. You still want to backup your important data to something permanent like tape or CD/DVD, but daily backups can be performed to the hard drive. Keep in mind that using any hard drive as a backup is the least secure way of storing data. Many users find it helpful to setup their second hard drive as the "Data Only" drive. Keeping the operating system and programs on the "C" drive and all data on the "D" drive. With this configuration, if anything goes wrong with windows that requires reinstalling, no problem, all your data is on a separate drive. Tape backup drives have been used for years as a reliable way to make data backups. However, a large drive such as this 120 gigabyte version from HP will run you about $1000.00. Large Tape backups are typically found in the business setting, but you can purchase smaller 20 gig units for about $400 if your storage requirements are less. Today, many companies simply use external hard drives for backup rather than tape. Most companies are now selling Network Attached Storage(NAS) devices that can be plugged directly into your home or office network. Once connected, you have instant disk storage available to any computer on the network. This type of storage is ideal for backups as well as a great place to store large amounts of data such as music files that you want to access from every computer on the network. Check out Linksys, Iomega or Buffalo for more information. There are many companies on the internet that offer paid storage and backup options like ibackup.com, capsure.com and Iomega as well as more specific backup options from Quicken and other vendors. These online storage solutions can run as little as $0.50 per month per gigabyte of storage. If you have a fast (always on) internet connection like Cable, FIOS or DSL, online backup may be the perfect solution for some users. If you are specifically interested in Online Backup rather than just storage then I would something like www.carbonite.com or www.mozy.com . Both of these providers offer automatic online backup for a little as $54 per year for unlimited storage. How do you print a professional looking CD or DVD? 1. If looks are not an issue, then you can simply write on the surface of the disk with a good permanent marker. Be careful not to use anything that will rub off the disk like a dry eraser marker. Not only will you not be able to identify the disk, but the marker dust can ruin your drive. 2. There are dozens of CD/DVD label kits that allow you to create a round label on your computer and print it on any standard inkjet printer. Although these labels may look great, be aware that they can come off. I sent out a CD proposal to a customer and the label came off inside his computer and destroyed his CD drive. Not great customer relations... So, if you must use labels, make sure your label stock is fresh, and that you clean the surface of the disk before you apply the label. Any oils from your fingers or mold release agents left on the surface of the disk will hinder the bond. The best way to clean the label side of the disk is to wipe it down with isopropyl alcohol and let it dry before applying the label. 3. 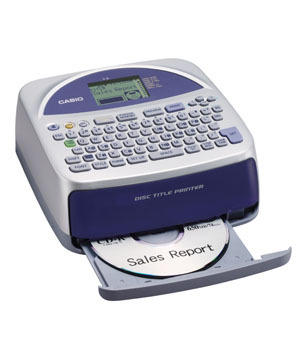 Casio just came out with a $129 label printer that prints directly on to the surface of the CD/DVD. Simply connect it to your USB port, create your design, insert your CD.... Your Done. They have two models, one at $99 for use with your computer and the other at $129, which has a keyboard for printing CD's with or without the need for a computer. Instead of using ink, these printers use a thermal transfer process that will adhere to most surfaces, thus eliminating the need to purchase special CD's or DVD's. Note: I have found that this unit works very well, however you will get the best results if you use totally blank media without any printing or embossing on the surface. Also, one thing I did not realize until I started printing is that you can only print on one area of the CD at a time and then you have to rotate the CD to print on another section. 4. It is also possible to purchase professional grade disk printers, which for the most part, use some form of thermal process to print disks. There are also various silk screening and pad printing systems as well, but are really beyond the scope of what I wanted to cover in this section. 5. Some inkjet printers are now coming with a CD holder which allows the printer to print directly onto the surface of specially coated CD's. The advantage of this system is that you are not dealing with labels. The disadvantage is that you need to purchase special blank CD's which tend to be more expensive and the variety is limited but it does produce the best results. I am always looking for ways to cut down on the number of wires that I have coming and going from the back of my computers. We will never get rid of all the wires, but this Wireless Printer adapter from Ambicom will at least eliminate your printer cable as well as allow you to relocate your printer up to 50 feet away from your computer. With the purchase of additional adapters, you can share a single printer with up to 30 computers. Simply plug this small transmitter into any available USB port and a similar receiver into your printer and you are ready to print wirelessly. Also available at CompUSA and others. UPDATE (12/01/10): Since this writing, Wireless printing has become very common and many printers now come with built-in wireless adapters making it easy for every computer in the house (PC or MAC) to print to it. Initial setup can be a little tricky but it is well worth the effort. Other than having to change batteries every once and awhile, installing a wireless keyboard and mouse is probably one of the most useful additions to the home/office computer. If you are like me, you already have wires all over your desk and eliminating the wires to the keyboard and mouse would really clean things up. I also really enjoy being able to settle back in my chair with my keyboard on my lap and type away. For about $40, you too can go wireless. For those of you who have a multimedia computer connected to the living room television, Gyration has a great small wireless keyboard and mouse set that you can use in mid air up to 25 feet away. One note, most of the wireless systems I have used only have a range of about 4-6 feet, so don't expect to control your computer from across the room. Also, make sure you always have an extra set of batteries hanging around. Depending on where you live and what kind of internet service you have, you may be plagued with constant down times when you can't get your email, check your stocks or surf the net. For many of us, this is not a problem, but for a few of you, this can be a major problem. If your work depends on internet access and you can't afford to loose your internet connection for even an hour, read on. The most common problem that I run into is intermittent high-speed cable access. Assuming you have already checked your cable modem and router, if you use one, and the cable company says everything checks out ok, the problem usually ends up being due to a weak or poor cable signal caused by cable wiring problems. Long runs, old wires and defective or too many splitters can all reduce the incoming cable signal. Your cable modem should be connected to the most direct cable connection to the street. At the most, you should only have one cable splitter between your modem and the street. Generally, I find that I have to replace the splitters every 5 years or so. Check all connections for corrosion and clean or replace any discolored connectors. Replace any cable with the highest quality cable you can afford. You may have to change the way your cable is routed around your house and where it splits off to other TV's to correct the problem. For those of you who absolutely have to have your internet connection up all the time, you may want to consider a backup connection. I don't have the room here to get into the specifics of setting up backup internet connections, but I can let you in on what is available. For those of you that have a single high speed connection like cable or DSL and have a home network, Netgear as well as other vendors have routers that will automatically switch to a standard dial up connection if your primary connection fails. If your computer has a built-in modem, can configure your modem to dial up a connection whenever your high speed connection is not available. If a dial-up phone connection is too slow, even for a backup, Hawking and others sell a Dual Wan Router that will allow you to connect two high speed providers (cable, DSL or FIOS) to one network. In the event of a failure on one line, the other takes over. So you could have both Cable and DSL or Cable and FIOS running. The last option is to purchase internet service from one of the cell phone providers in the form of either a USB device that plugs into your computer or a Wireless MyFi device that will allow you to connect to the internet over the cell phone network. Note: this service costs about $59 per month and is much slower than your standard Cable, DSL or FIOS service. WebMail - The easiest and lowest cost way to approach this problem is to use an all Internet based email system such as Gmail or Yahoo mail and regardless of where you are, you can log into the mail system and everything is the same. POP or IMAPI - If Web based email is just not your thing because it is too slow or for some other reason, you can also read these accounts into an email client such as Outlook. It usually requires changing some settings on your account and in some cases you may have to upgrade your account. Once your account is set up, you can configure Outlook to read your Gmail or Yahoo account. Hosted Account - If you have(or Want) your own email account such as "bob@yourname.com" and you really want all the features of big business running Outlook with Synchronized calendars and contacts with your blackberry or smart phone or mail coming into multiple computers then email hosting may be for you. Hosting is where you pay someone to host your email account on their server giving you all the features of a large company. You can have all the features and benefits of a large corporate email system like email backup, spam protection, virus protection, synchronization and calendar sharing without the high cost of servers and hardware.